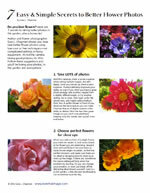 Published Tuesday, March 15, 2011, OK personal/derivative use; link www.lovethatimage.com. 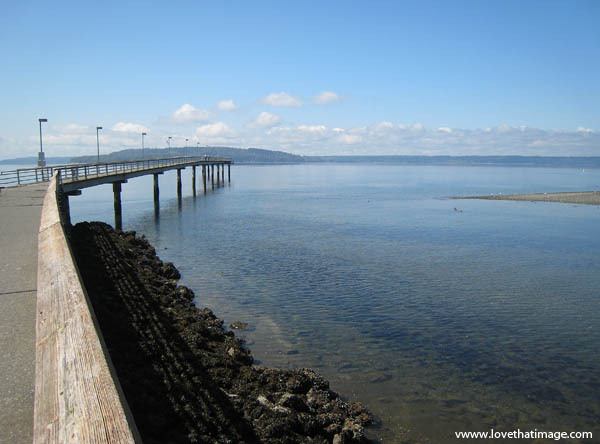 A neighborhood fishing pier in Des Moines, Washington, out over the waters of Puget Sound. Since it’s been raining and wintry for it feels like months and months unendingly, I thought I’d go to the archives for a sunny day to cheer us up here in the Pacific Northwest. I like it here but sometimes the weather really gets to me. I want to go outside and garden! This photo is my Best Post of the Week. Visit Watery Wednesday and Outdoor Wednesday for photos with a theme, as well as Blue Monday, Wordless Wednesday, Weekend Reflections, Shadow Shot Sunday, Skywatch Friday and Scenic Sunday. I love photo memes; can you tell? If there is only one photo below, click on Sara’s Fave Photos for others. Nice photo! Have you ever seen fish caught there? The water looks clear, but shallow. wow, so it ends there.. cool picture… was here for WW. love the perspective in that fine pic. Good one, Sara. I like the angle. Beautiful — love the perspective. How lovely, it’s a great composition and makes me want to see the sun! I love the sky, the sea and the idea of fishing here. Happy St. Patrick’s Day. this is a glorious photo. Wow your photo is beautiful! Great shot. I’d love to take a walk on this out over the water. Nice shot. It sure is beautiful on Puget Sound when the sun comes out. Beautiful shot! I love the scene! Great composition! Have a great weekend! Great photo! What a gorgeous view! I love to fish. When I do get to go, it has to be off the bank or a pier. No boats for me. The perspective of this shot is great. I would love to be walking out on the that pier right now. In Florida where i grew up, all of them were straight and a bit boring. Leave it up to the Pacific Northwest to come up with one that is beautiful. This is one of those pictures I could see on a wall. I love the coast, and this photo makes me want to go to Seaside, Oregon. The photo reminds me a bit of the area North of Astoria, Oregon. it looks so serene here, I wonder if people catch many fish form the pier. would love to go fishing there. Piers are lovely. My grandparents lived along Rejang river in Borneo, they had their private piers. I learn swimming from there. A quick glance leads one to believe that the pier extends to the distant shore! That is a beautiful photograph. Some folks wonder why I travel so much. You know, I see a photo like this and I want to be there. I want to see it, experience it and enjoy it as it looks so pleasing and delightful. I think if I was there, I could forget my troubles and the troubles of the world for a few fleeting moments and just be like the water and the sky, just be. Beautiful image. I too am tired of the cloudy, cool days. I love to fish and this looks like an interesting spot. I like the sensation of infinity your picture gives… Nice job ! Too much rain depresses me too. Thanks for sharing your blues. Very nice! It’s as if that pier leads you right up to the blue sky!